This update is accessible via the “Testing” release of Boundless on Steam. Please report all issues discovered to new posts in the #support category. The following release notes are not final and should not be considered complete or exhaustive. Exoworlds: This release introduced the new Exoworld system. This allows us to add temporary worlds to the Boundless universe. These worlds will be the platform for future gameplay not possible on the permanent worlds. Blink, Rift and Umbris: New Level 7 worlds, materials, creatures, blocks and gear can now be collected, crafted and forged. What did we say about these in the latest roadmap? Roadmap: Special Exoworlds and Farming! Prestige: As proposed and debated we’ve done a balance pass over the Prestige system and block values. All materials now generate prestige proportional to the effort of production. This Testing release is definitely a work in progress. There have been many changes especially with the introduction of the Level 7 worlds, mobs, meteorites and special gear. This will take some time to balance. We’ve released this to Testing to get feedback from the community. New roaming worlds, called Exoworlds, are accessible from some of the existing worlds in the game. They are accessible for a number of days before moving away from the known worlds never to be seen again. Exoworlds are identified by their trails and aura, as well as the path they take in the sky. They are mid and high level worlds, and provide new ground for exploration, mining and hunting. Exoworlds cannot have beacons or campfires placed on them, so nothing can be protected. Regeneration does not occur, so anything built on them will remain; however, it is accessible to all citizens, and will be lost when the exoworld goes out of range. Be careful what you put there! Atmosphere level slowly increases in the last 30 minutes on exoworlds so level up your protection, eat some food or get off the world. Distances to exoworlds are based on the world level that they orbit, when on lower level worlds the distances are relatively small, but the higher level worlds they are very far. Exoworlds are a platform for future new gameplay unrestricted by player beacons and new world themes. Some exoworlds are similar to the known worlds, but some are more dangerous and special than anything seen before. 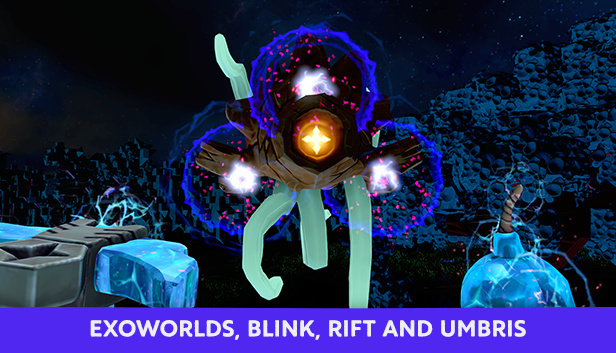 These “special” worlds contain new resources: Rift, Blink and Umbris, as well as creatures made of these materials. These creatures are incredibly powerful — approach with caution! Harvesting special resources allows the creation of higher tier weapons, tools, tech and blocks — the most epic yet seen! Added a new set of Rift, Blink, Umbris and Oortstone block: Refined, Compact and Decorative. Rift, Blink and Umbris creatures and weapons each channel two elements: Rift channels Shock and Chill, Blink channels Blast and Burn, Umbris channels Corrosion and Toxin. When damage is applied it uses the element type that does the most damage. Special creatures can sometimes apply debuffs from both their channeled element types at once! Special worlds have even more dangerous atmospheres than existing elemental worlds Rift is Potent, Blink is Volatile and Umbris is Caustic. Added a new set of visual effects for special materials: explosions, creatures, impacts, and item effects. All instances of Darkmatter updated to match the new naming convention ‘Umbris’. Reduces Player confusion when using the term Dark elsewhere. The prestige system has had major work in rebalancing both prestige rewarded per block type, and by the total calculation of prestige within a beaconed area. The main aim was to rebalance the prestige values for all blocks so that they are more accurately related to the cost of collection and production. This brings them up to date with changes to the rarity of blocks since the prestige system was added to the game. The prestige calculation has also been updated to better reward sufficient variation. All blocks will now give prestige, including: Soil, Rocks, Foliage and Trunks, which will now count towards your total. All meshes will also give prestige: machines, doors, poles, beams, torches, storage, flowers, etc. The only items that don’t give prestige are Air, Mantle, Water and Lava. The old prestige system calculated prestige as the sum of all block prestige for placed blocks in the beacon, combined with a percentage bonus of that prestige based on variation of blocks, otherworldly colours and chiselling, and the amount of built vs unbuilt space within the beacon. The problems were that users were able to spam high prestige blocks in a solid block and get massive prestige, whilst the percentage bonuses often meant that placing a block could actually reduce your prestige instead due to the bonuses fluctuating and having a much larger negative impact than the small positive increase in the base prestige. The new prestige system works such that prestige will never, ever decrease as a result of adding a block, chiselling a block, or adding a plot to the beacon and works to prevent spamming a single category of block from providing large prestige boosts; the increase in prestige may be minuscule or even 0 (eg, spamming a single category of block too much), or may add more prestige than it normally would do (eg, if you previously had spammed a single category of block, but the changes now being made are evening out the distribution so that those blocks that previously gave little to no prestige are now permitted to provide more), but will never reduce the prestige. The system of percentage bonuses is reworked into instead providing extra prestige without respect to the base prestige of the beacon, again in such a way that adding a block, chiselling a block or adding a plot to the beacon will never reduce prestige, but may provide little to no extra prestige, or more than would normally. The chiselled bonus now takes variation of chiselling into account so that the maximum prestige requires a decent variation of chiselled shapes so that spamming the beacon with a single chisel shape type will not produce a large prestige boost. Some beacons may find that they now get a prestige boost compared to before, but others prestige will be reduced, sometimes greatly should the old system have been abused too much. However in general prestige will remain fairly constant across all beacons. Fixed a bug in prestige where metal doors would be classified as otherworldly in colour. Added “dug-up” variants of the base soil types closing an exploit loop for their drops in-line with all other natural blocks that have additional resource drops like rocks etc. Can still plant grass into dug-up soil so building/interaction wise will behave no differently. Made changes to a few XP rewards on crafted objects to better reflect the effort to gather and craft the input material and taking into account market surplus of input items. Reworked item flexibility so that values can go up to 150, to allow the new more powerful gear to have lower values. Rebalanced existing gear values so that the resulting effectiveness is almost identical to what they currently are given the same Intelligence and Power, but may vary slightly in some cases due to the way the maths works. Setup the new tools and weapons to have lower flexibility to make them challenging to forge to high levels. Elemental creatures have significantly higher attributes than before. Watch out for them! These stack with the exotic buffs which make exotic elemental creatures incredibly potent. Exotic creatures are now less likely to appear on lower tier worlds. The number of exotic buffs that a creature has is dependent on the world—an exotic creature on a lower level world is more likely to have only one or two, an exotic creature on a higher level world is more likely to have three or four. Added world blinksec distance to the world details shown in the HUD when targeting a world with a totem. Added world atmosphere type and level to world details. Added exoworld time remaining to world details. Added atmosphere and exoworld time remaining to warp locations. Disable snow ground-covering effect when in builder / beacon mode (B). Updated cleanse bomb effect text to make it clearer what they’re doing. Simplified atmosphere types in text to always be Volatile, Caustic or Potent. This was duplicated across the skills, foods, character stats, world and warp information. Added new music themes for the Level 7 worlds. These are already in the Original Sound Track but will now be accessible in game. Can you find and trigger all the themes per world? Optimised entity saving in some cases to reduce the chances of performance issues. Updated SSL libraries for stability/performance improvements, with the aim of improving portal opening performance. Some improvements to world server performance. Corrected spelling error in all Shielding Food descriptions - impluse to impulse. Fixed a bug with beacon alignments not being properly reset when leaving and then rejoining a guild. Fix for advanced locked shop stand and request baskets not allowing deposits or withdrawal for players with access on the lock. Fix rare crash when using the d-pad while viewing a tooltip in a smartstack. Fix for places screen sometimes showing the wrong current world. Fixed filters on the knowledge screen so that ever item appears in exactly one filter and they are sensibly categorised. Fixed a bug where Healing Boon 2 & 3 forged Bombs were not counting towards collecting Healing Bomb Combat Objectives. There is a bug in the changes to gem gear forging when you have the forge epic, meaning that the efficiency is reduced. This will be fixed before going to live. DONE - It is our intention to add an improved fuel for portals which can last for a longer time than the existing shards. This is not in the current build, but will be added; hopefully before going to live, but maybe afterwards. DROPPED - After listening to feedback, we will reduce the time taken to craft stones to zero to make it consistent with timber. Enabled XP multiplier for discovering regions (and give extra XP for regions already discovered). First region discovered is worth 50 XP, second 100 XP, third 150 XP, etc. Discovering all regions on a 50 region world will return ~63,750 XP. Discovering all regions on a 35 region exoworld will return ~31,500 XP. Guild Control now Gives 8 XP for placing them within a beacon, up from 0. Basic Torches have been set to 0 XP to match the XP of other instant handcrafted recipes. Increased XP on surface resources. We were finding gatherers were collected XP on harder worlds at a much lower rate to other activities, the new values should better reflect the rarity and effort to collect higher tier Surface Resources. Changed the way Teaching Foods work. Teaching foods will give bonus XP on a fix amount of XP (sort of like a reverse defeat penalty) and will last until it has given bonus XP for that chunk. There is no longer a time limit on the buff. Most players should see an increase on the bonus XP they gain from each bit of food, especially on slower activities - such as building, surface resource gathering and hunting. Balance pass on the Level 7 creatures and combat. Lower tier Wildstock charge less times in row to make them easier to fight. The lowest tier will only ever charge once to help new players the most - as they’re often surprised by the multiple charge sequence. Added 2 new Skill Pages (pages 4 and 5). This should allow level 50+ characters more options to diversify their character’s skill sets without needing to rely on multiple alts. Corrected spelling error in ‘Desconstruction’, in the title Deconstruction, is Fun. Removed full stop from Objective title Sapphire, So Good in all languages. Updated impulse to Impulse in Shielding Loaf and Shielding Risotto for capitalisation consistency. Added missing error text when booted from an expired exoworld, and text on the warp trying to lead back to that expired exoworld. Stopped Oortstone gear appearing in request baskets when requesting Blink, Rift or Umbris gear. Added actions to the Sanctum Editor to allow rapid colouring of all blocks in the world. Target a block and then change all matching instances by selecting a new colour. Fixed rare crash when viewing a plot with an active buff machine. Fixed issues here beacons couldn’t be aligned to Guilds and Factions. Fixed augment position for special slingbows. Fix client and server crash for level 11 atmospheres. Fixed crash when placing augmented items into Request Baskets. Fix for occasional client crash when returning to sanctum. Added option to the World Builder to control the world size during generation only execution. Longer lasting portal fuel added: “Oort Amalgam”. Crafted from Oort Shards, and a new drop “Meteorite Ichor” which can be collected from meteorites on Lucent worlds. Oort Amalgam is three times as potent as Oort Shards as a portal fuel, and so a maximum fueling will last three times as long as before. The fuel bar behaves as before, but when the amount of fuel goes above the Oort Shard maximum and new green bar shows the extra fuel. Fixed request basket item visibility to include tax. Really can’t wait. This should get me back into mining! Hold on, just grabbing my asbestos suit. That is a wonderful work around for the snow ‘problem’. Many congrats to whomever came up with this simple fix! Why, out of interest? This makes shards harder to get unless you’re at higher tier world level. Makes the paradoxical you-need-this-to-farm-this world-hopping even more difficult as far as I can see. Also puts yet more level gating to entry of the gleambow event? Feels like this one needs a good run on testing and plenty of our feedback given the breadth of balance changes. I never used it. I’m actually glad it’s going to 0. In my book it’s been an exploit since day one. I actually wish it would have been silent nerfed. Now a bunch of people are just going to spam it more now then before till it hits live. If they were planning to level that way anyway, why does the timescale matter? If it was silent nerfed those lvls wouldn’t get spammed. Thus the exploit would be used less. Cubits earned excessively from said exploit takes away from potential funds for this game. More complaints about dead areas due to people just plotting and not building because of all the plots they have from using said exploit. I’m sure there will be people who will build even more tables to spam the exploit harder now. But hey guess it doesn’t really matter since it’s already been around for so long. Im fine with the nerf. I was actually expecting it sooner. I was around for that too. I also never used bombs to mine and thought it was kinda ridiculous how people reacted to it. Also they could have easily made a hot fix post about it and gave it a day for release instead of at least a week.